Loyal Garner, Carole Kai, Nohelani Cypriano and Melveen Leed. 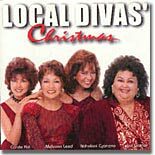 Here is their first album, all four of them are very famous Hawaiian "divas" and have recorded many award winning albums here in Hawaii. They have recently teamed up together (hence the name) and are appearing throughout Hawaii on a new tour.